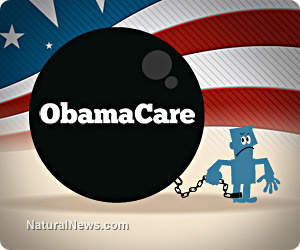 (NaturalNews) Even before it is fully implemented, Obamacare is already starting to self-destruct. The White House announced last week it will simply invent its own interpretation of the law and "delay the enforcement" of the employer Obamacare mandate for another year, to 2015. This, we are told, is to allow businesses more time to "smooth" compliance with the law, but that's only the cover story. In reality, the entire private sector economy was preparing to fire tens of millions of workers, cut their hours and radically downsize companies in order to avoid going bankrupt under Obamacare mandates that no one can afford. Described as a "train wreck" by one of its original authors (Sen. Baucus), and called a "fiasco for the ages" by the Wall Street Journal, Obamacare is a massive government boondoggle that's headed for complete disaster. In a desperate effort to get out of the way of that oncoming train, insurance companies are scrambling to flee the market entirely. America's largest health insurer, UnitedHealth, has just announced it's closing shop in California and walking away from all health insurance customers there.